The People's Republic of China is now the world’s most populated country with well over 1 billion people. Long before the 1949 Communist takeover, China was closed to the gospel, both because the cross was seen as a symbol of foreign oppression and because of sheer logistics. But, with the explosive growth of Christianity and the rise of untold millions of house churches, the need for Bibles and resources is unprecedented in world history. Conservative estimates that there are more than 100,000 believers in China – most still without Bibles. Moreover, China has emerging as a world leader in technology making the digital option the obvious method for equipping the Chinese churches with desperately needed resources. 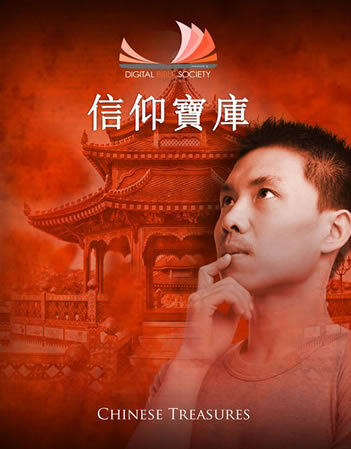 Since 2001, the Digital Bible Society has been serving the Chinese church with the production and distribution of Chinese Treasures – a digital Bible library loaded with a variety of Chinese Bibles, books, commentaries, tools, and resources contributed by over 30 organizations all beautifully presented in both Simplified and Traditional typeface. These free and free-to-copy libraries have placed priceless resources in the hands of millions of believers, enquirers, and leaders. The Chinese Treasures 2012 DVD is the long awaited update with a completely updated interface and study Bible, numerous improvements with the inclusion of many resources including books, audio, and quality video resources.